This .zip by artist Luis Miguez contains 1 B&W illustration, usable for your own “Vampire: The Masquerade" and “Vampire: Dark Ages" Storytellers Vault products and, of course, for your Chronicles. 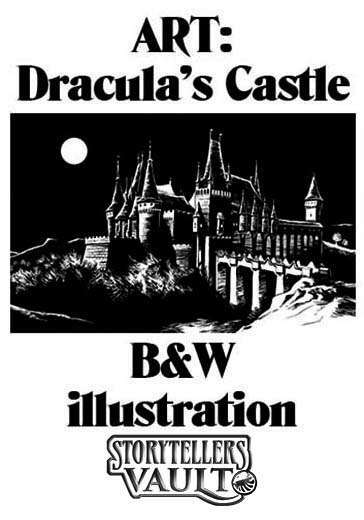 That artwork is absolutely new, exclusive and specially created, and depicts a Transylvanian gothic castle. The .zip includes an tiff archive 11x17,38 cms size (the same size the usual horizontal images at “Vampire: The Masquerade" books) and another DINA4 size (usable for covers), both of them at a 300 pps definition, so they can be included in any professional-quality document for print. Please, note that the artwork within this document should not be modified, and only can be distributed and/or used with commercial purposes via Storytellers Vault. Check all my Storytellers Vault publications here!! This title was added to our catalog on August 29, 2018.